Bacon is a true crossover food. You can eat it at breakfast, lunch or dinner and not feel ashamed. It can be used in appetizers, meals, snacks and even desserts and still taste amazing. Oh, and who the heck doesn’t enjoy the aroma of freshly cooked bacon??? Bacon has always been a popular food, but it has definitely enjoyed a pretty solid upswing in popularity lately. We at DMR enjoy statistics and we definitely enjoy bacon, so it seemed like a pretty natural choice for our next fun non-digital stat post. First, a refresher; Let’s make sure you know what bacon is. Bacon is a cured pork product that is most commonly fried, grilled, smoked, baked or boiled before consumption. It is most commonly associated with being a breakfast side-dish, but, as noted above, it has many, many other culinary uses. 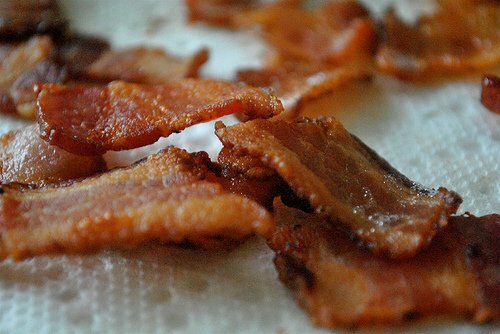 Now that we’ve established what Bacon is, were are some of the more interesting bacon facts and statistics and facts that we could dig up. Disclaimer: Although bacon is really, really tasty, it is also kinda bad for you. Please eat bacon responsibly.